Once again the London Ritz proves too much of a temptation for me , I guess that i`m hooked on the place and can never visit the big city without heading off there to eat. It holds everything that appeals to me about my passion for gastronomy. The dining room is as grand as it can get anywhere in the World. The service is precise , attentive , so damn professional and friendly. The Pianist plays my tunes and the staff smile and address me by name It`s simply my perfection and they have mastered the art of making their customers feel amazing. 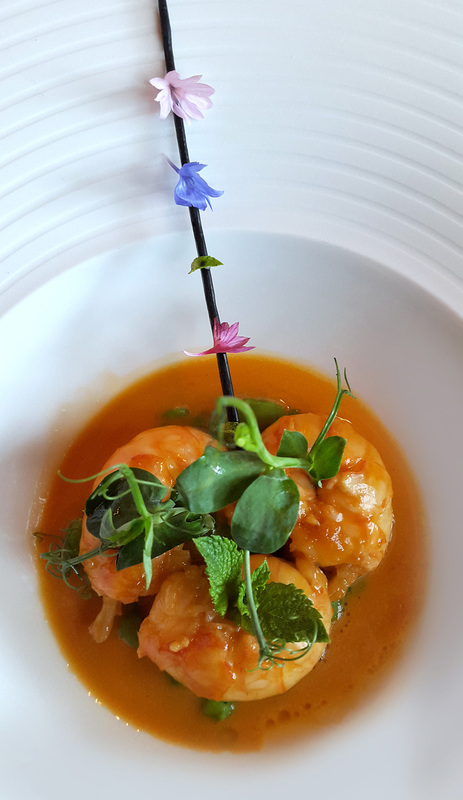 As for the food…..WOW , it keeps pace with modern trends , it`s no holes barred luxury , it`s priced very well considering where i`m eating , it`s cooked to absolute precision and perfection by proper Chefs that can actually cook proper food. As for my weakness ,Desserts , well I simply have the very best Pastry chef in the country creating his delights for me , Lewis Wilson . All in all and without a second thought The Ritz is my number one place to eat in the UK. So this visit for lunch was the final meal of a very special weekend. We had dined at `Dinner by Heston` , `The Square` , `Yauatcha` and also managed to squeeze 3 visits to `Burger and Lobster` in for lunches. 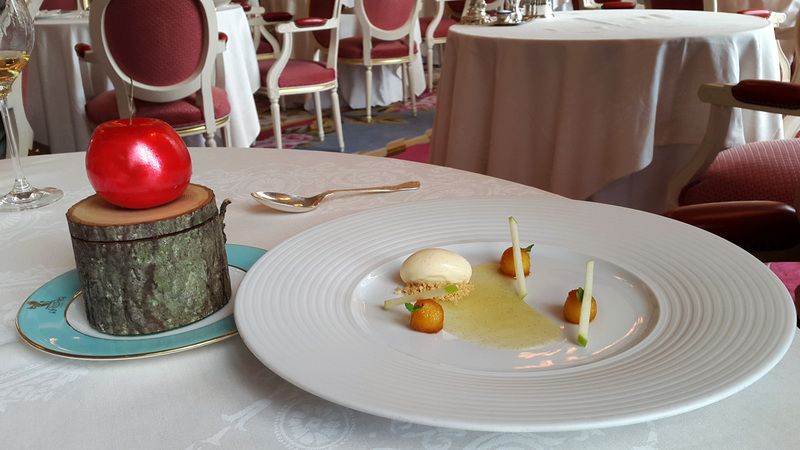 The Ritz lunch was our special `custom` meal put together by Lewis and the team with a special little surprise twist as a grand finale….wait and see. 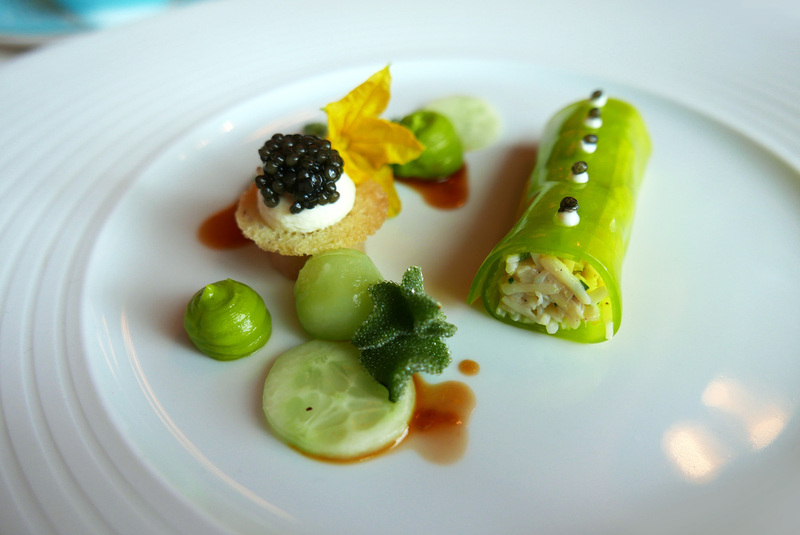 Crab Roll with Summer Vegetables , Caviar and Flowers. 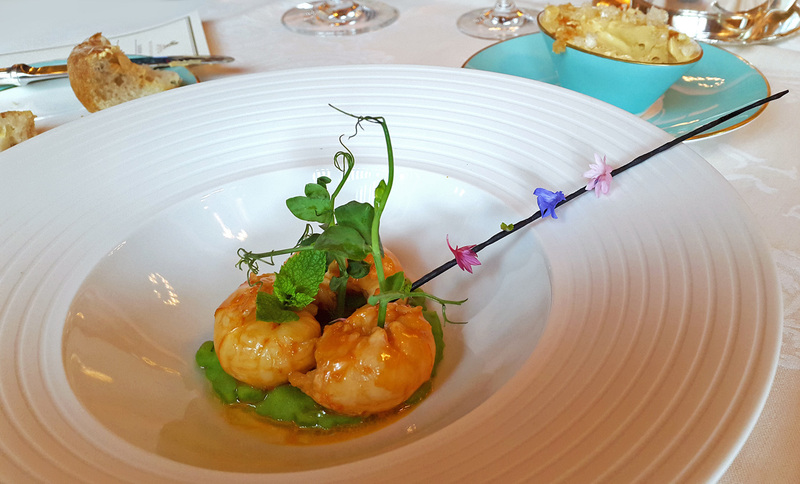 Langoustines with Mint , Peas and Black Garlic ….stunning. 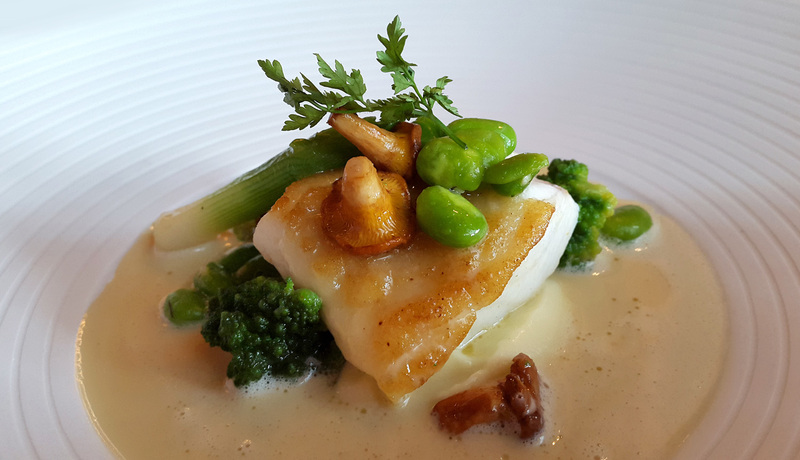 Turbot with Romanesco , Girolles and Champagne sauce. Fillet of Veal with fresh Morels , Madeira and Glazed Veal Sweetbreads. 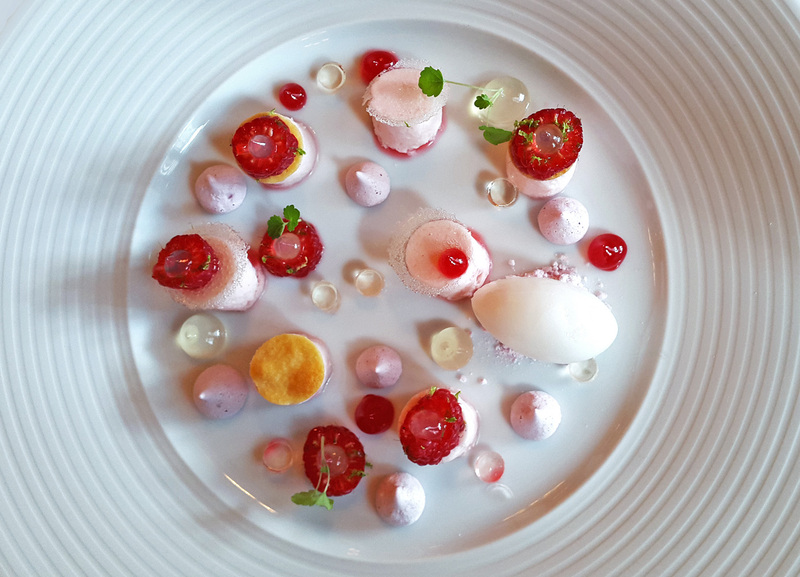 I think you`ll be able to taste this dish just by looking at the photo , the flavours were just incredible. 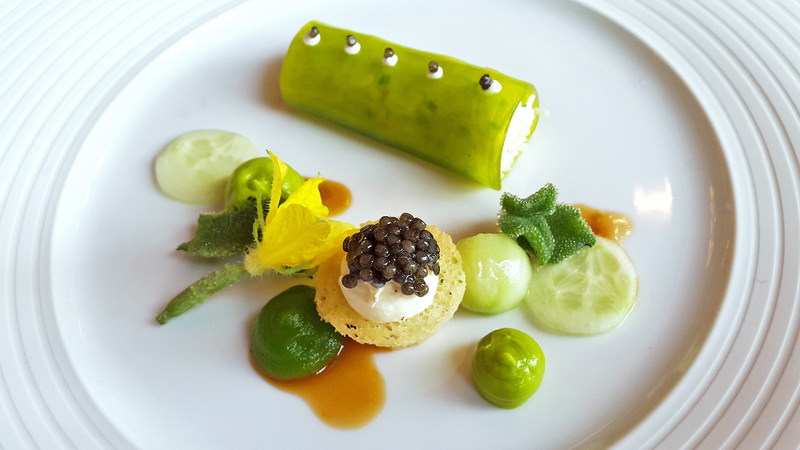 This is my idea of perfection for a main course , classic cooking of premier ingredients with strong powerful flavours. 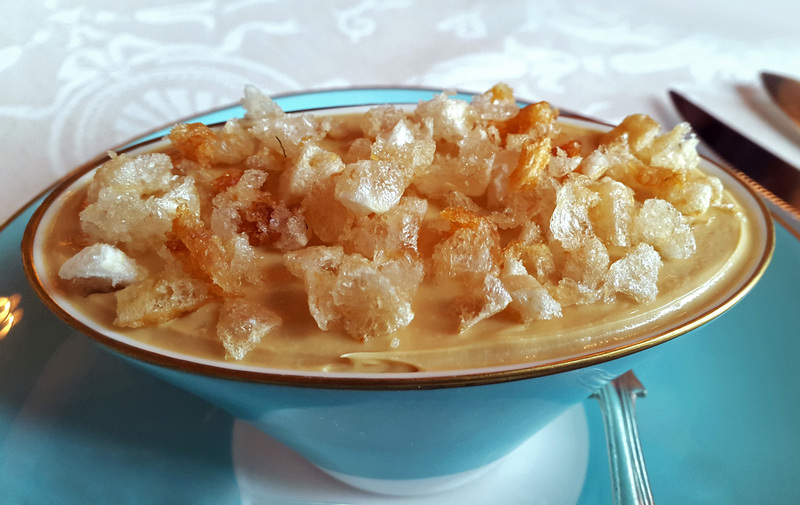 I was stunned into silence , closed my eyes and just drifted away into foodie heaven. 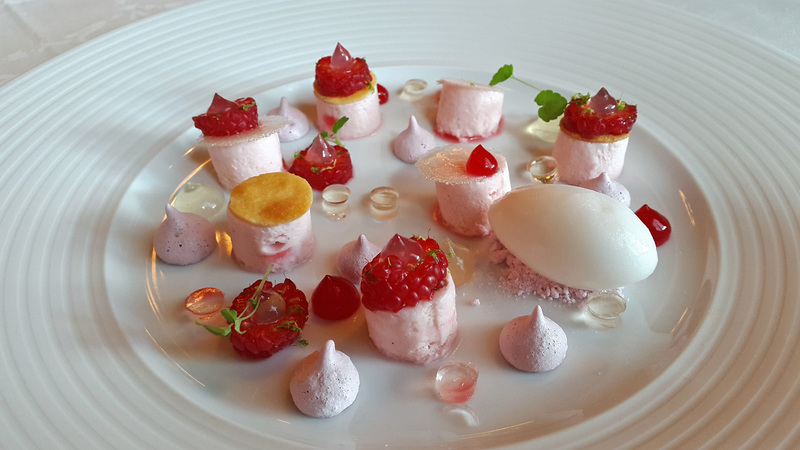 Now its over to head Pastry chef Lewis Wilson to create some magic beginning with this interesting Raspberry and Elderflower creation. 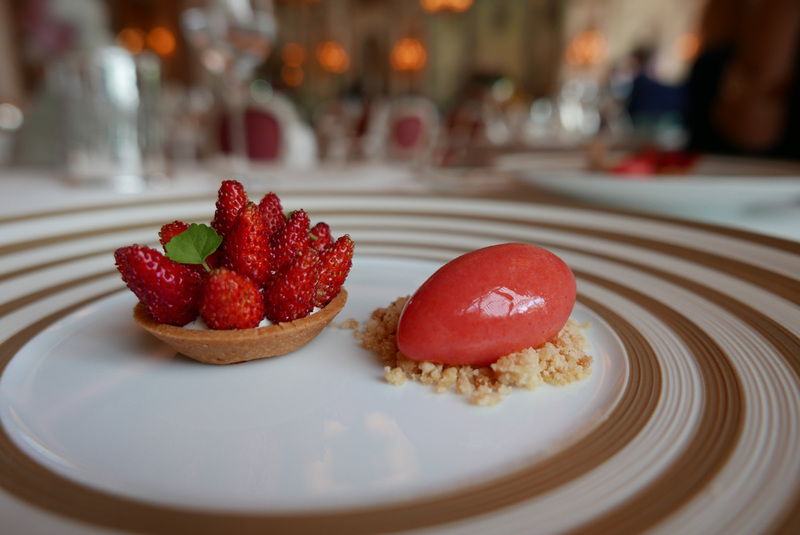 Wild Strawberry Almond Sable Custard Tart , Strawberry Sorbet on Crumble , Atsina Cress. Nice to see that some restaurants are still serving the classics. 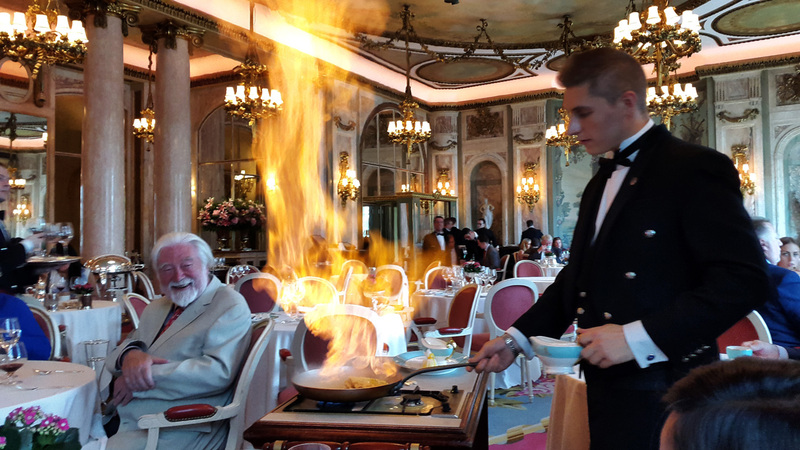 It`s not something that I would ever order but it`s great to watch the skill of the Matre`d making the flambe Crepes Suzette for the extremely happy diners. The restaurant smells incredible , hot Butter and Caramel scents fill the room. Oh and finally after spending all lunchtime trying to work out who the `celebrity` was that was sitting opposite me it finally hit home. The star of one of my all time favourite films , James Robertson Justice from Chitty Chitty Bang Bang. I was going to ask for a selfie but politeness kept me from doing so. Quite a good job really because as soon as I Googled him , I actually discovered that he had died in 1975…..40 years ago. Ok , so i`m a bit behind the times , stupid boy. 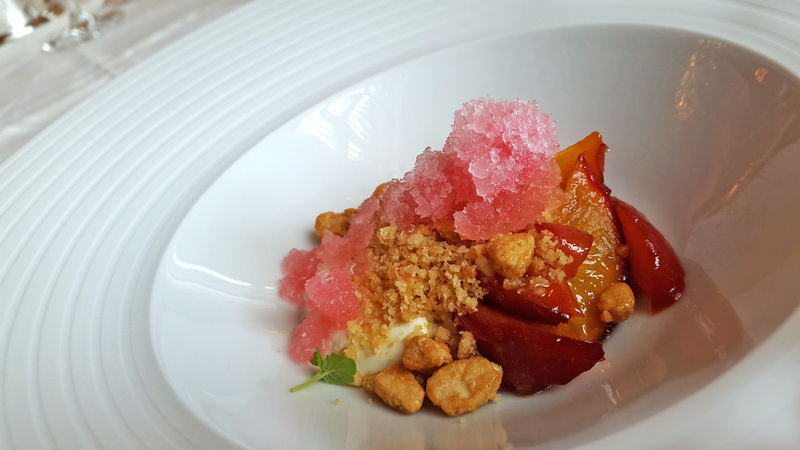 By now the lunchtime diners had all but disappeared out of the restaurant and with one dessert to go it was finally time for me to take a deep breath and to be sensible for a few minutes. I spotted a few pointing fingers from the staff and quite a bit of attention directed over to my table so knew that the special pud was on its journey. Clea , my good lady and better half just sat open mouthed when it landed on the table…..”Why is mine different from yours” ? 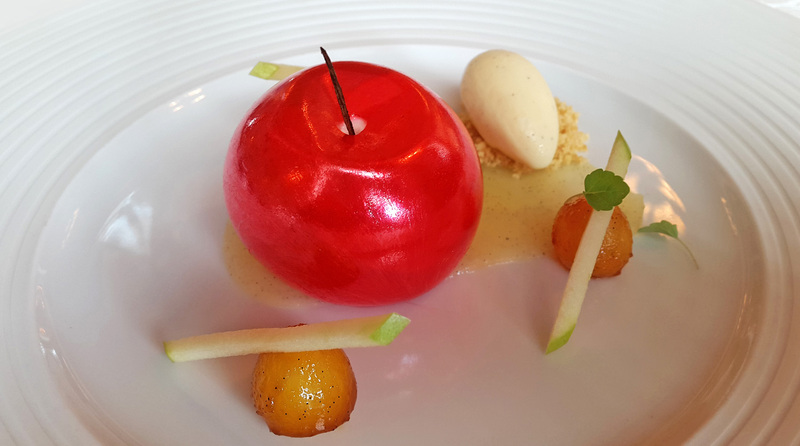 A stunning Calvados mousse filled `blown Sugar` Apple sat upon an `Applewood` log by Clea`s side. “What do I do with this “ ? I instructed her to remove the Apple and maybe there was another dessert inside the wooden log. My plan worked , she just thought it was……. ` a Log `. So off came the top followed by a 60 second open mouthed silent stare. 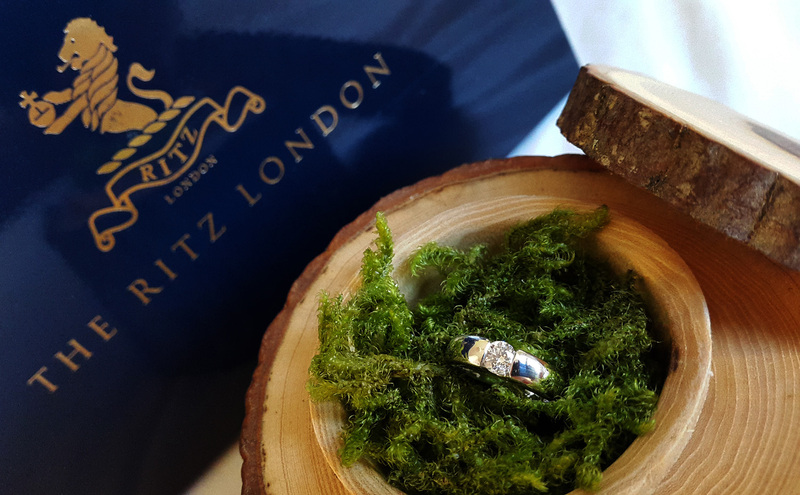 By the time Clea looked up I was down on one knee in The Ritz and doing the business……Clea was still staring in numbed silence. Anyway , the restaurant clapped , I went the same shade of Red as the Sugar Apple and finally she said “Yes” ……… 8 hours later. 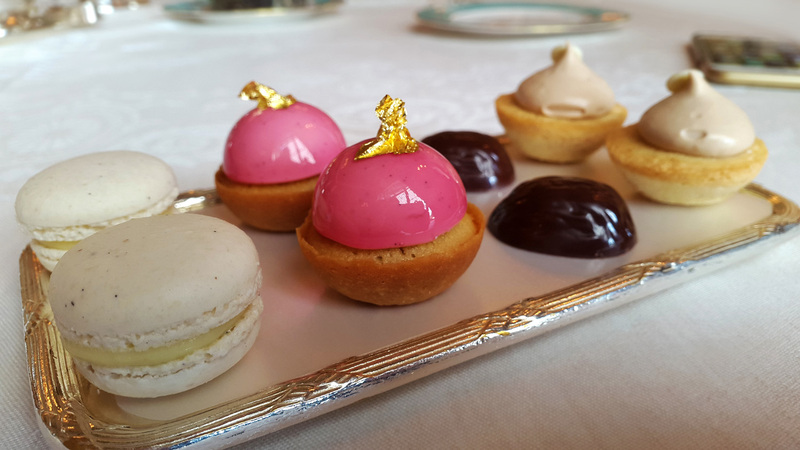 Just when we were totally full and content the Petits fours arrive with Coffee…..C`mon guys. I`m a firm believer in scoffing everything and just to show my appreciation and respect to the Pastry chef I scoffed the lot. …would be extremely rude not to. Once again a huge thank you to the team at the London Ritz , I`m forever a fan. 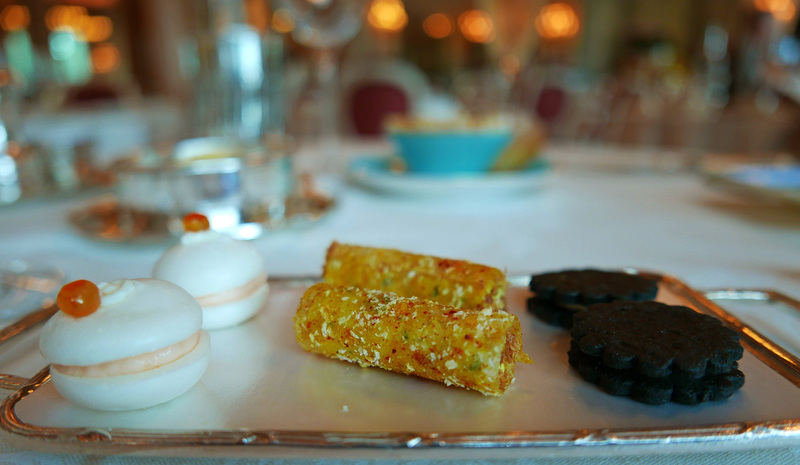 TO VIEW MORE PHOTOS FROM MY LUNCH AT THE RITZ THEN PLEASE CLICK HERE. Stunning report. I always enjoy reading (and drooling over) your accounts. Big congrats as well!